4. 28g plastic coated wire found in craft stores for flower arrangements or maybe found in hardware stores. Too thick or too thin doesn't as work well on jigs 1/16 oz or heavier. One spool of wire will last a lifetime for hundreds of jigs and coated wire won't corrode. If the wire width is too long for the lure's width, cut the wire shorter such that it is close to the lure's thickness. As you can see, the wire can be installed on jigs as light as 1/32 oz or any weight, though you can use a finer gauge wire for 1/32 or less ounce jigs. There is no need for a jig barb with the wire lock added, though the L wire will still work with them in place. Nice, I was wondering if they were store bought, now I know. Great info thanks for sharing it with us. The crappie we have been catching have loved your single tail plastics. I've been using the chartreuse colored ones on a pink jig head. It's hard to tell but the upper one in the attached pic is one of yours. I thought you only trolled lures. Didn't realize you caught fish with a lure I sent you. Yes, I mainly troll and I catch crappie trolling but when the trolling season comes to an end, then I vertical jig. I also replied to you last year and told you I caught a wiper under a bobber, with one of your jigs. How often do you use tandem rigs? I did great on different days over 9 years ago but haven't since. What is your best depth range to fish tandem? Not often at all, mainly during the late Fall when the crappie are stacked up, like they were in that pic. I tried using them when Ice fishing but I kept getting so many tangles, that I gave up on that idea. When we were fishing with that tandem rig last Fall, we were in 25 to 40 FOW, using the drop shot method on that rig. I was losing so many, that I tie up 3 or 4 the night before we went out, so I could quickly change one out without taking the time to tie one up. I used the ones I got from you pretty quick then started tying on plain hooks and using those Gulp Alive minnows about 1.5" long and they were working great too. I think I may try tandem rigs this year in spring and fall when they worked great last year I fished them. Pretty cool getting two species on different hooks. 9-15' was my best depth for tandems. 1. Use no-collar jigs if possible. If a jig has a collar, I use pliers to flatten it and then use wire cutters to remove it without damaging the hook. Collars do more damage to soft plastics than fish and using super glue to keep the grub in place is worse yet. 3. Cut a section of wire, wrap it once around the base of the line tie. Tip: make sure the wire is long enough so the end almost reaches the curve of the hook. You don't want it too short or the L bend won't be wide enough for the grub body to insert. Great idea and thanks for sharing the step by step method with pics you use to create the grub lock. One question, you said the jigs that have collars damage the grubs more than the fish, do you find that not to be the case with the grub locks? Grub keeper collars do damage by increasing hole size and plastic splitting - more so after a few fish and when using smaller diameter grubs. which allows reusing lures far more times. Man did I hate when soft plastic lures slipped down and I had to push them back up. Super glue is worse and shortens the life of a bait even more. With good success but I find that the fish, I think they are smaller fish, nibble the paddle tails off, in a lot of cases and destroy the action of the bait, have you ever had this issue? 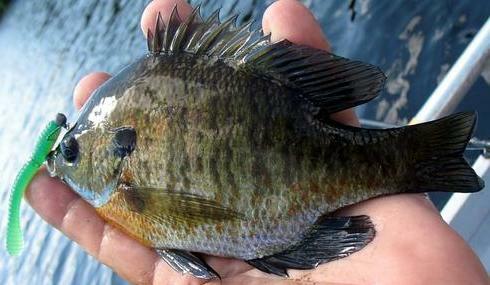 The only time I see tail bit off is when sunfish are biting thin straight tail grubs. Other tail designs - no, including paddle tails and curl tails. Retrieves at the steady pace those two tail design require are great for active fish, but I found that when I assume fish are just hanging out regardless the depth, I do so much better! The Beetle Spin idea I posted recently believe it or not gives a straight tail grub a nice action from the spinning blade. I read an In-Fisherman article recently about the paddle tail design plastic, so I gave it a try. I did not have any luck with it for the species I was trying to catch, walleye but I wondered if it would work for smaller fish like crappie. To my surprise, I had great success with them but as I said, I also had the issue with the fish biting the tail off, as I said but my thought was that the tail creates such a vibrations that it drives those little fish nuts. The bigger fish seem to just take the whole lure. See pic, sorry I got that finger in the way . the tail creates such a vibrations that it drives those little fish nuts. The bigger fish seem to just take the whole lure. Years ago the Sassy Shad by Mr Twister was one of my go to lures for all species. For panfish, 1" and a 1/16 oz jig head; for everything else, 2-3" Shads rigged on 1/16 or 1/18 oz ball head jigs. Same for Mr Twister curl tail grubs - caught a lot of fish on them if fish were chasing lures. But much of the time I found fish aren't in the chasing mood and started using Slider Worms, thin straight tail grubs, Crappie Magnet cone tail grubs and other lures that moved slightly - just enough for fish to detect slight lure actions. That's what I found got me the most bites especially on super slow retrieves or using those lures under a float. Fish senses are keenly aware of everything within a certain radius and may or may not attack a lure to feed. In any case, getting them to attack for whatever reason is the goal and finesse fishing seems to be the best way. The smaller size is what I've used for Panfish, especially the crappie. I think I'll be using the larger version of the rib shad next year for walleye. As you said, "getting them to attack for whatever reason is the goal and finesse fishing seems to be the best way. ", I could not agree with you more. I agree, when it comes to finesse action fishing lures, design is crucial and unique characteristics make all the difference especially during very slow retrieves or under a float. Makes me wonder why fly tiers throughout history have made tying trout flies an artform with many fly fishermen insisting that certain fly patterns must be used to up the odds of catching trout. In fact some flies are collector items and highly valued. When I think of all the hype over the decades pushing certain lures over others, either similar or uniquely different, it's no wonder reason is suspended and that the same passion that fly fishermen have for flies is no different for bass anglers. There is only one bass forum to my knowledge that does not allow any opinions that do not support conventional reasons bass strike lures which usually centers on feeding. I was banned from that forum for expressing the possible logical explanations fish strike lures to begin with - none having anything to do with feeding. But recently there seems to be a growing interest in lure characteristics that possibly provoke fish to strike regardless of species. It opens up a whole new world of conjecture and experimentation of lures any angler can test and share results. Favorite colors are secondary considerations; lure design (shape and action) is primary. Fishing in my opinion follows a recipe for catching fish and the most important ingredient of that recipe is lure design. Bad design, few or no fish on most days. You are certainly correct with your statements, pretty sad that a forum like you mentioned does not let members express their opinions on fish behavior while feeding, that seems insane. Speaking of fish feeding, you must have ice on your little pond out back by now, have you tried ice fishing it yet this Winter? No ice to speak of and little forming for the next five days. It's mostly site sponsors who expect it and with no room for opinions that may lessen sales. There will always be the classics I like catching bass with: Spooks and some other surface lures and certain crankbaits, but more and more I like my own creations better and catch many fish with them. One lure making site that I just discovered has some incredible lures made with skill and originality; one video site shows different modifications of hard lures that catch bass. Wow, with all those storms there a few weeks past I figured it was getting to be as frosty there as it is here, I guess it warmed back up. All we've been getting is rain, high winds of over 25mph and temps above 45 degrees. Even with that, a buddy of mine is catching fish from local lakes offshore. Nothing big but at least he's not stuck indoors. Not in any hurry being retired and almost immune to cabin fever. Wow, that is warm for Jan. Is that normal for your area? We had a warm up like that a few weeks ago but now it is really cold, 7 degrees here, when I got up this morning and I think it's suppose to get up to 24 degrees for a high. It's not as fun getting out in temps like that but I still try and get out fishing at least once a week. I don't know if global warming has much to do with the crazy weather patterns in the northeast, but something's not right. When NY experiences tornadoes and hurricane winds in the warn season and temps averaging above 38 degrees daytime/ 25 degrees at night and then close to 50 degrees with a steady downpour once a week, makes me wonder which practical joker's responsible. Over the 69 years I've lived here, temps were usually cold from mid Dec to early March - anywhere ranging from 10 degrees above zero to 35 degrees. Ice would thicken to 18 or more inches but hasn't in the last three years - at least not in southern NY and snow would be on the ground as high as 1'- 3' (4' max) from Dec. to March. A foot of snow before Thanksgiving melted in two days. Hope they're wrong - wouldn't be the first time. But one thing that might affect the Patriot game against the Chiefs will be the bitter cold wind chill. I sure as heck wouldn't be sitting in the stands! Probably should start my snow blower to make sure it starts.